Wow, it’s hard to believe that a week ago plus a few hours, Rio (PS Arikaree Bask) and I finished the Tevis Cup! THE Tevis Cup! Can I say it was the thrill of a lifetime? Quite possibly–I am hoping that it’s the first of many runs at the cup! Going into it, I had no idea whether or not we would finish. This was my first 100 mile ride and hers as well, not to mention we are flat-landers going into some intense mountains! I have been doing endurance and competitive trail for a few years now, but literally I am a baby in the distance world compared to some, especially those that I look up to. There may be some of you out there that don’t know what I’m talking about when I mention the Tevis Cup. 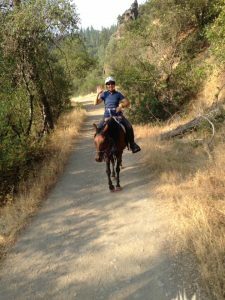 That’s merely the nickname for the Western States Trail Ride, and it’s 100 miles over rocky, mountainous and somewhat dangerous terrain in the Sierra Nevadas in California. Gold mining was big here–in fact, the trail itself was a thoroughfare for miners to get supplies and go between mining camps during the gold rush in the 1850s–in the area nearby the trail is the site on which some of the Donner Party met its fate. A lot of the small towns in the area and along the trail were historic mining sites. Landmarks that you reach along the trail retain their names from days of yore. The trail in many places is narrow, sometimes the drop off the side is sheer and precipitous. Lying below in the folds of the mountains is the American River–fast flowing water dashing against sharp rocks and precipices. The ride is touted as being the world’s most difficult endurance ride (as well as best known)–since I have not had the opportunity (yet) to ride many other very difficult rides I can’t say that I’m the best of judges, however it’s no walk in the park! It helps that I don’t possess a lot of fear (except for spiders, ugh!!! ), or maybe I don’t let it possess me–either way, I had an immensely fabulous time travelling this historic trail. OK, so 100 miles, no big deal right? Did I mention that you have 24 hours to get it done? This time is also minus 2 mandatory one-hour vet holds, plus several “gate and go” vet checks along the way. Complicating this further, beyond the difficult footing, steep inclines and declines, you also have to deal with the potential of being blocked down the trail by other riders, specifically if there should be an incident ahead. I’ll delve into that later! One more thing…the 24 hours? It’s all in one stretch, not broken up–no real sleep, and yeah….riding in the dark (which is actually one of my personal favorite ways to ride!). Now that you’ve had a little taste, I will continue on down this path in the next post, coming soon! You can follow along on this Facebook page, and at some point I will be posting these on our website, psarabians.com. As soon as my distance induced dementia allows me to remember how to log on to edit!! LOL!!!! Congratulations! I admire you and am just a bit envious!